FCMH Foundation donates scale to emergency dept. This scale was recently donated by the FCMH Foundation to the emergency department. From left are: Mike Diener, FCMH CEO, Foundation board members Ron Ratliff, Gary Butts and Rob Herron, and Corey Huffman, FCMH emergency department leader. The Fayette County Memorial Hospital (FCMH) Foundation board recently donated a scale to the FCMH Emergency Department. The 1,000 pound scale can easily be moved to the bedside for patients to be weighed, which helps staff accurately calculate doses of weight-based medication. The handles help steady patients on the scale, and staff can easily read the digital display in either pounds or kilograms. With over 17,000 patients coming to the emergency department last year, the scale will be a great asset. “As with any FCMH Foundation purchase, the first thing the board looks at is how the item will enhance patient care. When an item does that, it typically also helps streamline processes for staff. Combine those two and the end result is an overall increasingly positive experience for patients who come to FCMH for care,” said FCMH Foundation Executive Director Whitney Gentry. In 2018 the FCMH Foundation purchased 11 pieces of equipment, one educational class for staff and funded the remodeling of two waiting rooms within the hospital. Resources were generated from FCMH staff, community members and businesses in the form of donations, memorial gifts and fundraisers. 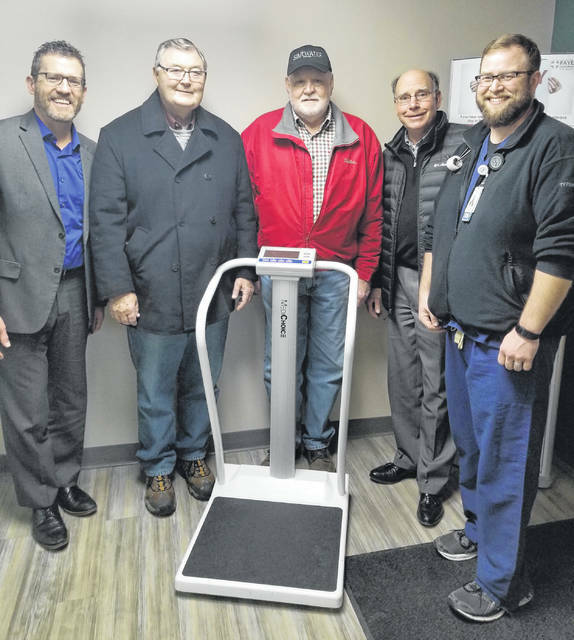 https://www.recordherald.com/wp-content/uploads/sites/27/2019/01/web1_1.24.2019-FCMH-Foundation-Donates-Scale.jpgThis scale was recently donated by the FCMH Foundation to the emergency department. From left are: Mike Diener, FCMH CEO, Foundation board members Ron Ratliff, Gary Butts and Rob Herron, and Corey Huffman, FCMH emergency department leader.